"I may get cold and wet, we may catch little, but every day is the best day ever, sorrounded by the beauty and mustery of nature." The Gippsland Lakes has been professionally fished since the late 1800s, and many of the fishing families have been fishing the Lakes for generations. Some current fishers are fifth and sixth generation Gippsland Lakes fishers. Gippsland Lakes is of significant social and economic value to both professional and recreational fishers. 60 tonnes of bait for recreational fishers is professionally caught in the Gippsland Lakes system. The Gippsland Lakes fisheries make up an important part of the fishing industry based out of Lakes Entrance. Lakes Entrance is the largest fishing port in the South east of Australia, and contributes significantly to economic prosperity and employment in East Gippsland. Meet Gary Leonard, a generational fisherman in the Gippsland Lakes. Gary shares his story on how and why he became a fisherman and what a day in his life is like. Gary loves supplying fresh, local seafood to the Victorian people, something all fishers pride themselves on. And remember 'its not as simple as it looks', well said Gary and thanks for sharing your story. Thanks to FRDC FishFiles for the video. Where is the Gippsland lakes fishery? ​The Gippsland lakes system is the largest navigable inshore system in Australia. Located 275km east of Melbourne, it is comprised of three major lakes; Wellington, Victoria and King. Five main rivers feed into the lake systems, providing a flourishing estuary with abundant freshwater, brackish and saltwater species. ​Like all Bay and Inlet fisheries, Gippsland Lakes fishers catch a mix of species, using a variety of fishing gears. Gippsland Lakes is the only remaining professional bream fishery in Victoria. Black bream is a popular table fish, and alongside tailor, carp, yellow-eye mullet, school prawns and dusky flathead constitute the majority of seafood from the Gippsland Lakes in recent years. In 2016/17, the fishery produced 316 tonnes of seafood for the Victorian seafood consumers. See the catch for each major species caught in Gippsland Lakes between 1978/79–2016/17 here. How are Gippsland lakes fish caught? Gippsland Lakes Fishers use highly sustainable methods to fish. One or two fishers man an open 6-8 metre boat, with some fishers working in a team of two boats, sharing the catch. Just over half the catch is caught using mesh nets, a third is caught using haul seine nets, and stake nets are used to catch prawns. The nets are mostly hauled manually as has been done since the fishery began. Mesh nets are used to target bream, flathead, mullet, luderick, tailor and silver trevally. Mesh nets are one of the oldest forms of fishing and are highly selective. A mesh net is a panel of net that is held vertically in the water. It is a selective way of fishing because the mesh size and the way the netting is constructed determines what size and species of fish is caught. Fishermen in Gippsland Lakes use a range of mesh nets depending on the season and what they want to catch. Knowledge of fish movements is vital so the net is set in the correct position. The nets are set at dusk and fished at dawn, when the fish are hand sorted. The survivability of undersized bream caught is over 90% (Grixti et al, 2010). Haul seining is a traditional style of fishing that has been used in Victoria’s Bay and Inlets for over 100 years. In shallow water, the haul seine is deployed, in a place based on fisher knowledge and experience. The haul seine forms an arc, and is used to surround fish and draw them towards the boat, avoiding fish getting stuck in the net, which means the fish are alive once encircled. Then the fish are sorted while in the water. The fish of market value are removed using hand-held dip nets and are placed into the ice slurry box. Non-market fish are returned immediately to the water without harm. Research has been shown that 97% of released fish survive, making the fishing method highly environmentally friendly﻿ (Knuckey et al, 2002)﻿. 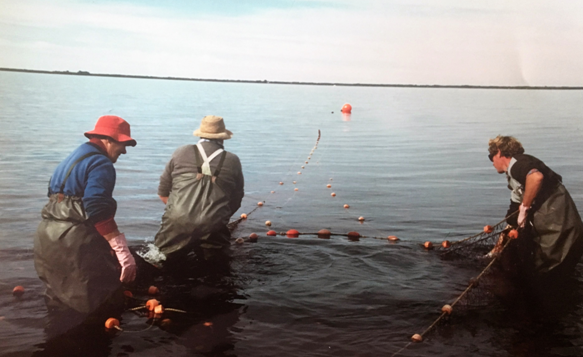 Mary Mitchelson, the first woman to professionally fish in the Lakes, haul seining in the 1960s. Stake nets target prawns. The net is staked by the wing ends across the current, and uses the current to open the net and wash the prawns in. The maximum spread of the net is 30 metres across. How is the GIPPSLAND LAKES Fishery Managed? The Gippsland Lakes Fishery is limited to 10 transferable licences. There are other licence classes also entitled to fish in the Gippsland Lakes, such as Eel licences, crab and bait fishers and this can result in some confusion of identification of fishing gear amongst the community. All gears, fisheries and rules are set out in the Victorian Fisheries Regulations 2009. The Gippsland Lakes Fishery operates under strict government-regulated management arrangements, and with a voluntary Code of Practice. Fishing days, with no fishing on weekends (from 12 noon on Friday to one hour before sunset on Sunday). haul seine nets no longer than 732 metres (note: fishers are not allowed to use a seine net and a mesh net at the same time). stake nets no longer than 66 metres. Fishers are permitted to use shrimp dredges, crab pots, 2 bait pumps, dip nets, shell shovels, 40 spider crab traps and 6 fishing lines. Area closures, including no fishing near river mouths, as per the Victorian Fisheries Regulations 2009. Minimum legal sizes, with both recreational and professional fishers having the same size limits. Very specific and strict daily catch and effort reporting requirements. Fishers in the Gippsland Lakes also operate under the Victorian Bay and Inlet Fishery Association (VBIFA) Environmental Management System (EMS), “A voluntary, industry-driven initiative”. The EMS is was developed to help fishers navigate ecological, social, political and economic challenges and manage the risks that they present. And it is designed for and by primary producers (such as commercial fishers) who have the knowledge and expertise to develop and implement best practice that meets both environmental needs and food production needs. Find a copy of the VBIFA EMS - here. Bay and Inlet fisheries are naturally variable fisheries, and highly dependent on environmental conditions outside the system. The environmental conditions in the Lakes, such as water temperature and salinity (fresh water flows, rainfall), also fluctuate which affects fish abundance. Thus, the ability to target a diversity of species in Gippsland Lakes is important for the viability of the fishery. In late 2017, the Victorian Fisheries Authority, released a report titled: Victorian Fisheries Authority (2017). Review of key Victorian fish stocks — 2017, Victorian Fisheries Authority Science Report Series No. 1. (click to view), which collates data and advice from scientists (using commercial fishing data) to provide an accurate and up-to-date overview of the fishery. All species common to the Gippsland Lakes (Bream, Tailor, Silver Trevally, Mullet) that were assessed in this review were labelled as 'Sustainable' or 'undefined' (where not enough data was available). Further, the 2016 Status of Australian Fish Stock (SAFS) reports can be found at www.fish.gov.au. They confirm that the Gippsland Lakes fisheries are in good shape overall - species specific reports below. Black bream – A species targeted by professional and recreational fishers, the stock status is not of concern, with the stock stable near average levels. The professional catch of bream has reduced substantially as the number of professional fishers have reduced. Eastern king prawn – The stocks are doing well, with catch rates above the long-term average. SAFS report Eastern king prawns (and school prawns which are also caught in the Lakes) as ‘sustainable’. Tailor – The catch rates are above the long-term average, and SAFS report tailor as ‘sustainable’. Yellow-eye mullet – In the past few years the catch rate of yellow-eye has decreased. The decline is most likely to do with processes outside the lakes system. Fisheries Victoria report that current management measures are expected to mitigate any risk. Sea Mullet – The catch rates are above the long-term average, and the stock status is not of concern. Luderick – The catch rates are above the long-term average, and the stock status is not of concern. SAFS report luderick as ‘sustainable’. A scientific study, published in 2014 by Fisheries Victoria, looked at the impact of net fishing near river mouths in Gippsland Lakes. It found that professional fishers mostly catch small quantities of bream in a fishing event – less than 50kg. Large catches of bream are not correlated with the spawning season. The report concludes that “commercial fishers do not cause a significant impact on the spawning success or subsequent recruitment to the fishery” Green (2014).